Olympia: Elliott 0-0-0, Olson 2-1-6, Schultz 0-0-0, Criswell 1-2-4, Kieser 1-4-7, Schmidgall 1-0-2, Springer 0-0-0, Thornton 6-1-18, Williams 0-0-0, Boudeman 2-0-4. Totals 13-8-41. 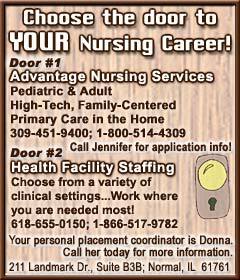 Three-pointers: Thornton 5, Olson 1, Kieser 1. Junior Varsity: Olympia def. Prairie Central 70-52. [JAN. 18, 2003] NORMAL -- Illinois State's 58-54 Thursday night win over Southwest Missouri State may have been delicious for Taren O'Brien and her Redbird teammates, but the junior guard claims it was hardly the "full meal." "It was only a taste," said O'Brien, whose team takes on Missouri Valley Conference leader Wichita State at 7:05 p.m. Saturday in Redbird Arena. "We're not satisfied by any means. But it's a taste of what could happen consistently if we can continue to work our tails off toward our goal of putting 40 minutes together." For the first 25 minutes, it looked like the Redbirds were doomed to go hungry for victory again, as SMS stretched an 11-point halftime advantage into a 41-27 edge. But O'Brien, who scored 15 points to lead the 'Birds, helped provide the firepower for a 31-13 finish and an end to a four-game losing streak. Sharon Blade (nine points) combined with O'Brien and Jaci McCormack (seven each) to score 23 of those 31 points. Freshman Sara Stevenson's only shot of the game and second field goal of the season garnished Illinois State's entree by giving the 'Birds a lead they could keep -- and their first lead of the second half -- with 1:23 to play. Redbird coach Jenny Yopp agreed with O'Brien. "It (the win over SMS) definitely is a taste of what we can do when we become even more consistent," said Yopp, whose 'Birds are 3-10 overall, 1-3 in the Valley. Stevenson's shot was a show of depth as much as skill for Illinois State. "We all knew Sara would hit that shot," said Yopp, who prefers to call her starters "pacesetters" because, quite frequently, it's players off the bench who "start" the team on a roll. "That wasn't a surprise because we know we have 10 or 12 players who can contribute and who, on any given night, will have opportunities to help this team win. It's a neat thing." Against SMS, it was the Redbird bench getting the job done, with McCormack, Blade and Stevenson joined by Zora Skrabalova, who had four points, three steals and a block in just 16 minutes. The subs combined for 17 points, 13 rebounds and five steals. Shocker cast. Buckner, the Valley's top rebounder with 12.2 boards per game to go with 14.8 points, is complemented by Carlesa Dixon, the league's No. 1 scorer, who shoots 52 percent from the field, 42 percent from 3-point range and 79 percent from the free-throw line. Point guard Tisharria Huggins has averaged 18 points over her team's last three games -- victories over Creighton, Drake and Indiana State. Yopp has long recognized the Shockers' substantial talent. What has put them on top has been steadier play. "Wichita State is more consistent," said Yopp. "They make great use of their offensive rebounding ability, along with their quickness and length on defense. Defensively, they will challenge you aggressively." Yopp describes Buckner's ability to create scoring opportunities on the offensive boards as a valuable weapon for coach Darryl Smith's Shockers. "Buckner has 62 offensive rebounds and 162 shot attempts," said Yopp. "She gives herself chances to either finish or get the (foul) call and shoot free throws (82 attempts in 12 games). She gives them so many more opportunities to score." 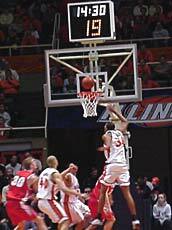 [JAN. 13, 2003] It was basketball alumni day for the Illinois basketball program Saturday in the Assembly Hall. And if you didn't know any better, once the game started you would've sworn that the Illini were playing a brand of basketball that was more like that seen in the '70s and '80s. What's up with that? Well, do you remember life before the 3-point line? That's the way much of this game played out, even though the Illini eventually hit eight 3-pointers to seal and slug out a 69-63 victory over a Wisconsin team they shared the conference title with a year ago. Not only that, but the first half didn't exactly give you a great deal of confidence heading into the second half. In fact, Greg Taylor, who was seated on press row, said he had a real bad feeling about the second half. While sitting there he must've slipped me some of his famous Cubs Kool-aid, because I felt we had weathered the storm (where did that overwhelming sense of optimism come from?). Luckily, I was right for once. Illinois came out of the locker room like a team possessed. Bucky Badger must've forgotten all about Cook, who sat most of the first half on the bench mired with two fouls. But somebody should've told Bucky that Cook would STILL probably start and play a little bit in the second half. Apparently, Bucky never got that message through to the troops, and Cook opened up the second half scoring with a wide-open dunk! James Augustine continued his phenomenal game by scoring a deuce and marksman Sean Harrington nailed a 3, and for all intents and purposes the Illini were 2-0! According to the LDN's stats, Cook blew up for 24 second-half points and seven rebounds and totally dominated the final 20 minutes. But had it not been for Augustine's huge first half, Cook's performance might well have been for naught! Augustine erupted himself by scoring 13 first-half points, including an important 3 from the corner as the half was winding down. So, with Cook on the bench for over 10 minutes the Illini STILL held a 36-30 lead at intermission. Then Illinois REALLY got busy. In addition to the before-mentioned second-half offensive barrage, the Illini's defense stiffened as well, not allowing a field goal for the first 9:30 of the frame. Wisconsin's big star, Kirk Penney, finally did wake up late in the game as he hit some big shots, including two 3-pointers, to pull the Badgers close… but, not close enough. Penney did finish with a double-double, going for 18 points and 12 rebounds as he helped Wisconsin win the rebounding wars 31-29. But Illinois held The Cheesers to 35 percent shooting over the final 20 minutes after they went for 60 percent in the first half. The Illini also out-assisted them 18-8, and both teams had a hand in 10 turnovers each. A sold-out Assembly Hall crowd of 16,500 roared their approval for all the former Illini stars as well as the critical victory over the Badgers. However, once school is back in session, many of the rowdiest, best fans will be back to assist the Illini even more! Things REALLY toughen up for Illinois next as they travel to Iowa on Wednesday and to Indiana on Saturday! Speaking of tough, how 'bout those Railers? Going into the hostile environment of Lanphier's home court, not many gave Lincoln much of a chance over Richard McBride and the Lions. But, the Railers took the fight to Lanphier all night long and came away with another hard-fought victory. The Railers now find themselves at 15-2 and IF they can take care of business at home, should be in the driver's seat to upset Lanphier AND Southeast to win yet another CS8 title! Hats off to Derek Schrader for his outstanding game Friday night and to Ryne Komnick for his stellar play over the last three or four games. Next up is the shootout versus Pekin at the PCCC. Last week the Monday night sports showcase hosted some Lady Railers along with our Railer seniors of the week. Brittany Ingram and Jennifer Whalen did an outstanding job representing their school, their team and their program. These girls have really turned their season around over the holidays, and more exciting times are sure to follow! Little men -- big impact: Bunch is a jet-quick point guard. Runs the show despite his diminutive 5'9" size. He is a defensive whiz with excellent vision in the open court and in half-court sets. Hartem put a bump in Mount Pulaski's roll by taking out the Hilltoppers 52-37 this past weekend. Always rivals, according to several sources this was the first win for Hartem over their nearby foes in quite some time. The win takes Hartem to 7-5 and 3-1 in league play. We were right when we said that wild-card teams haven't fared all that well. According to the stats, wild-card teams were 9-39 coming into this year's playoffs. So all the smack talk from last week went for naught, and most of those teams, including the ones who made great comebacks, all went down this week. Every home team won. No predictions for next week, but I'd sure like to see boyhood favorites in the big game! ...Tonight at 6, right here on the LDN link and on CITV and FIX-96.3 FM. Last week: "Lincoln Railers splittin' the competition"